Supported by the Latvian Ministry of Culture, this concert was built around an artistic link between Latvian-born New York painter Mark Rothko, a quintet of award-winning Latvian jazz musicians and 10 different Latvian composers. 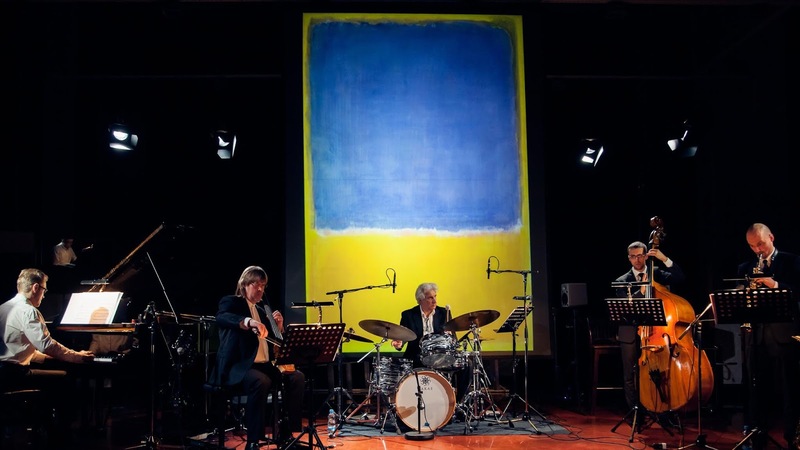 I freely confess to having known nothing about Latvian jazz prior to this gig, and not much about Latvia itself, but I have seen some of Rothko's paintings up close, and I remember them as being larger than life, loud, and dramatic. So I expected the music to reflect that personal view of the paintings, to be a bit experimental, angry and loud. In fact this was beautifully played chamber jazz and it took me a while to reset my expectations. Taken on its own the music was excellent, but was surprisingly conventional in structure and very melodic and respectful, and therefore not at all what I had expected. The tone was set by the leader Maris Briezkalns on drums who played mainly with brushes or soft mallets. Once I managed to overcome my preconceptions I found there were some really fine melodies and an excellent set of soloists. Victor Ritov on piano and Gints Paberzs on tenor in particuar both managed to let rip with some fierce improvising from time to time. The unusual addition of harmonica and cello added to the overall melodic feel. I confess that I couldn't see any direct links between the Rothko paintings (which were projected onto a screen behind the musicians) and the individual tunes. I'm tempted to advise future listeners to ignore the paintings and concentrate on the music which is perfectly capable of standing in its own right. However everyone reacts differently to modern art, so my personal perceptions may be very different from yours. LINE-UP: Maris Briezkalns (d) Viktors Ritovs (keys), Gints Pabērzs (ts), Edvīns Ozols (bass) Raimonds Macats (cello, harmonica).